They say you can't fry with extra virgin olive oil. "They" say "it's unhealthy" and that it burns creating toxic byproducts. Some folks say, for instance, that "one should only use extra virgin olive oil for finishing and cold applications, and use cheaper, refined olive oil or other types of vegetable oils to fry and cook with." You've heard this mantra repeated by chefs, perhaps prominent public figures and even Food Network celebrities. You might've even heard this from dieticians and those who seem like a good source of information on the topic of culinary applications with extra virgin olive oil. Well, guess what? "They" are wrong, sort of. What's more than likely, is that "they" are using poor quality, old, and/or adulterated extra virgin olive oil. If the FFA of an olive oil is over .5, will it smoke at lower temperatures? Heck yes! If it's old, oxidized, and devoid of good phenolic content, will it stave off the formation of toxic aldehydes that typically form in other types of cooking oils when heated? Nope, at least not as effectively! So the key is knowing the crush date and chemistry of the extra virgin olive oil you are using. Most TV celebrity chefs would go blank if asked to define FFA, oleic acid, or phenols and the role they play in the stability and health benefit of extra virgin olive oil. Most doctors and dieticians are well behind the curve on their practical knowledge of the chemical parameters of extra virgin olive oil, and which ones are particularly important when we look at nutrients, stability, and how they affect suitability for various culinary applications. Bring the water just up to a simmer and then add the mushrooms. Allow to steep for 30 minutes before using in recipes. Strain before using. In a medium saucepan, bring the stock to a simmer. Keep warm. In a large saucepan, heat the olive oil and add the mushrooms. Season with salt and pepper and cook over moderate heat, stirring, until softened, about 5 minutes. Add the shallots and saute for another few minutes until the mushrooms are nicely caramelized and the shallots are cooked through and translucent. Add the rice and cook, stirring until well coated with olive oil and beginning to toast. Add the wine and cook, stirring until the wine is absorbed. Add 1 cup of the warm stock and cook over moderate heat, stirring constantly, until nearly absorbed. Continue adding the stock 1/2 cup at a time, stirring constantly, until it is nearly absorbed between additions. The risotto is done when it is opaque and just the sauce that has formed from the rice, creamy. About 20 minutes total. Add the truffle oil and cheese in at the very end, and adjust the seasoning with salt and pepper. Eat this now using any leftovers for the recipe below. Mix together 1/2 cup of bread crumbs and the beaten egg with the cooled risotto. Heat 2" of Extra Virgin Olive Oil to 350 F. in a heavy pot with relatively high sides. Preheat the oven to 250 F.
Place the breadcrumbs in a shallow dish or plate for rolling the arancini and cut the mozzarella into small 1/2" cubes. Using a scoop or spoon, portion out 2 tablespoons of risotto mixture and roll into a ball. Gently push one piece of mozzarella into the center of each ball and re-roll between your hands to encase the cheese. Roll the ball in the bread crumbs to fully coat and deep fry until golden brown. 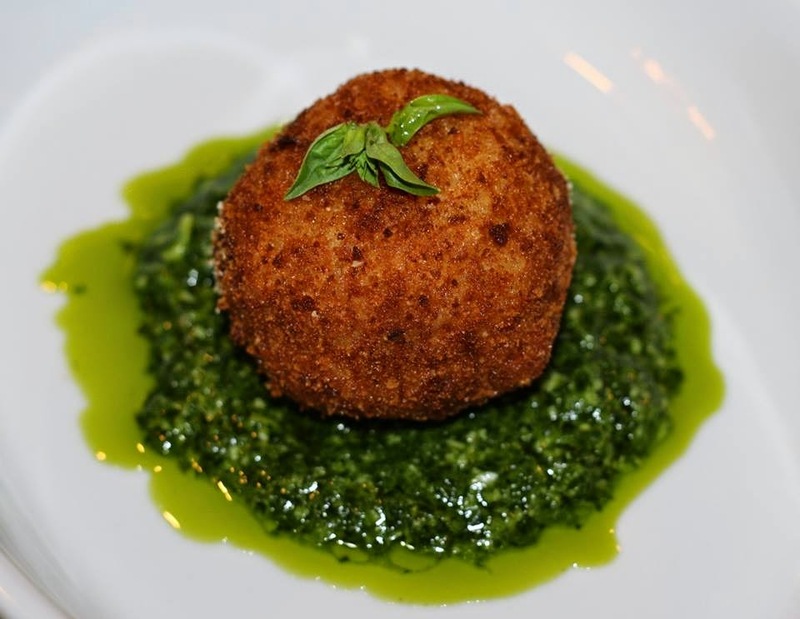 Place the fried hot ball of arancini on a rack and hold in the oven while frying the rest. Serve hot with the cheese melting in the center. Add all of the ingredients to the the container of a a blender or food processor. Pulse to combine and adjust seasoning with salt if desired. Serve with the arancini above or with bread, pasta, vegetables.... you name it.